In his address to the nation on Libya on March 28, 2011, President Obama presented a comprehensive explanation for why he authorized military action as part of an international coalition to protect the people of Libya and to enforce U.N. Security Council Resolution (UNSCR) 1973. In the intervening weeks and months, coalition efforts have been effective in protecting the Libyan population. The regime has suffered numerous defeats, cities and towns across Libya have been liberated from brutal sieges, strong sanctions are in place, and the regime is encountering serious difficulties raising revenues through oil sales or other means. All these actions and outcomes are consistent with UNSCR 1973. The United States and its international partners acted decisively and with unprecedented speed to mobilize a broad coalition, secure an international mandate to protect civilians, stop an advancing army, prevent a massacre, and establish a no-fly zone. In contrast, the war in Bosnia raged for nearly two years before the first NATO military operations took place, and three years before NATO began ground strikes to protect the civilian population. Acting under U.N. Security Council Resolution 1973, and as part of a multilateral coalition with broad international support, Operation ODYSSEY DAWN (OOD) was launched on March 19, 2011, to protect the Libyan people from Qadhafi’s forces. Responsibility for leading and conducting this mission — now called Operation UNIFIED PROTECTOR (OUP) — transitioned on March 31 to an integrated NATO command, with all operations fully under NATO by April 4. The focus of OUP is to protect civilians and civilian-populated areas under attack or threat of attack. The mission continues to concentrate on three elements: enforcement of a naval arms embargo, enforcement of a no-fly zone, and actions to protect civilians from attack or the threat of attack. The Department of Defense is providing forces to NATO in support of OUP. U.S. armed forces now provide unique capabilities to augment and support NATO and coalition partner contributions. These capabilities include the following: electronic warfare assistance; aerial refueling; strategic lift capability; personnel recovery and search and rescue, intelligence, surveillance and reconnaissance support; and an alert strike package. The United States is also augmenting the NATO Peacetime Establishments at the three NATO Headquarters with a number of additional U.S. military personnel. The additional strike assets described above are on continuous stand-by alert status to augment NATO and coalition forces if their capacity or capability were to be deemed inadequate by Supreme Allied Commander Europe (SACEUR) and those assets were subsequently authorized for use by the U.S. Secretary of Defense. 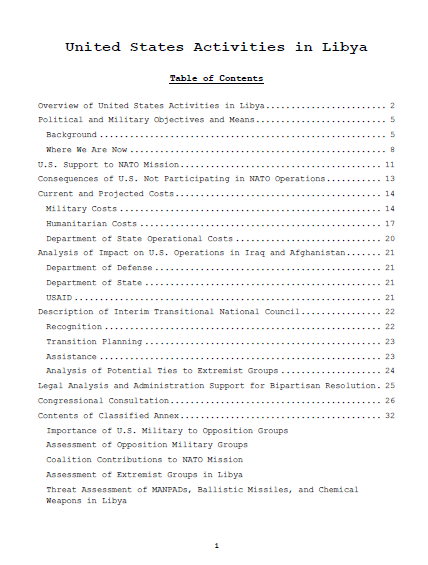 A list of specific United States military assets is provided in a classified annex. As President Obama has clearly stated, our contributions do not include deploying U.S. military ground forces into Libya, with the exception of personnel recovery operations as may be necessary. As articulated at the NATO Ministerial discussions on June 8, the decision has been made to extend the operation for another 90 days, from June 27, 2011, until the end of September 2011. This sends a clear signal that NATO will stay the course and will keep up the pressure necessary to bring this crisis to an early conclusion. We are not aware of any direct relationship between the TNC and al-Qaeda, Hezbollah, the Libya Islamic Fighting Group (LIFG) or any other terrorist organization. There are reports that former members of the LIFG, which had been initially formed as an anti-Qadhafi group, are present in Eastern Libyan and that some of them were fighting with opposition forces on the front lines against the regime. During the past two years, the Government of Libya had instituted a program to rehabilitate and release from prison members of the LIFG who had renounced terrorism, and some of the former LIFG members in Eastern Libya had participated in this program. The TNC has consistently and publicly rejected terrorism and extremist influences and we have not observed any TNC support or endorsement of the LIFG. In addition, the TNC has publicly declared the secular nature of its organization. The TNC and other members of the opposition have actively worked to open up Eastern Libya to civil society groups for the first time in the 42 years since Qadhafi took power. As a result, non-regime groups that had been previously banned, including the Libyan Muslim Brotherhood, have now organized and are participating in Libyan society. From public press reports, we understand that the Libyan Muslim Brotherhood has declared its support for moderate Islam, emphasized the important role of women in society-building, and formed a relief organization in Benghazi.